The book is the catalog for the Fashioning Fashion exhibit that’s currently running at LACMA (Lost Angeles County Museum of Art). In fact, the exhibit ends March 27th, so if you live in the area and you haven’t been, now’s the time! Go! GO!!! And please take me with you! When you can’t attend a major museum exhibit, the next best thing is to purchase the book that is often published as a “catalog” in conjunction with the exhibit. And so that’s what I did. I would love to see this exhibit in person, but I’m afraid that once again, vicarious experience is going to have to suffice! If you, like me, have to do this one vicariously, then get the catalog before it’s too late! Once the exhibition is finished and once the books are sold, it’s gone. What will you find in the book? 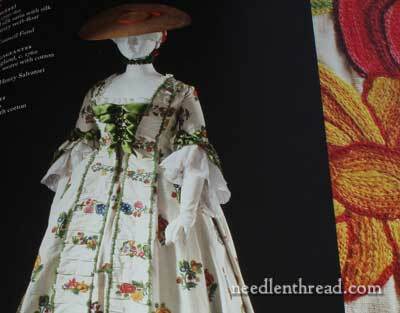 Besides good information on historical dress, you find fantastic photography of the exhibit pieces, including many, many close ups of gorgeously embellished clothing. Normally, you’ll see the photo of the full piece, juxtaposed with a close-up detail of it. And, oh… the details! 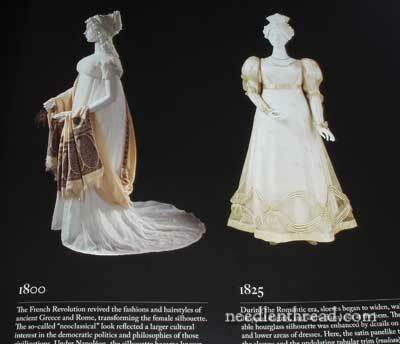 You’ll find cataloged herein not only a grand old pair of highly embellished socks, but shoes and parasols, bags and gloves, and all those accessories and undergarments and everything else that has gone into clothing the European between the years of 1700 and 1915. Did I mention close up detail? Poring over the photos will inspire you!!! And did I mention that I want to go? I love Kansas. But there are times… there really are times…. when I feel somewhat in the middle and quite far away from the edges! Go the exhibit! If you can’t go, do it vicariously and get the catalog while the getting’s good! Where to Find the Book! 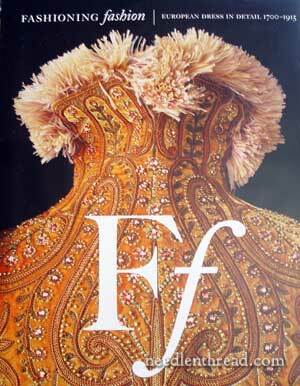 In the US, Fashioning Fashion is available here through Amazon. Yes, go! I’ve been twice and it’s a wonderful exhibit. 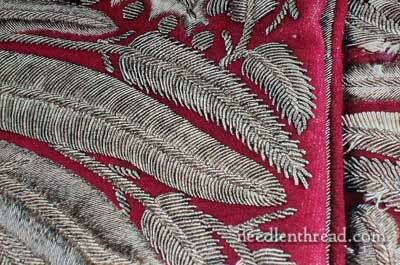 The items on view are in spectacular condition and nearly every piece is embellished with some type of hand work. The dress in the last photo above has turned into my favourite. 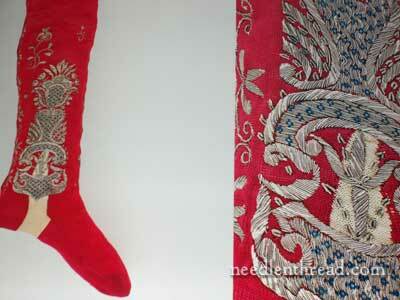 The colours of the wool embroidery are incredibly bright and vibrant. It’s like looking at a summer day in the form of a dress. Also, if you go, you can take photos (without flash). Ahhhh … these embroideries are stunning! The gold and silver work takes my breath away. Thanks for the review, inspired me for the day! I would love to go but I live in the Northeast of the lower pennisula of Michigan in a very small town. Talk about the boonies. I never see anything near here I was very surprised at the offerings at the County Fair I thought being in a rural areas everyone would be doing some type of needlework. Was I ever wrong. Yes! Go I’ve been once and I’m going again before it closes. The collection is awesome! It has been kept in excellent condition. The shoes are the only thing that they didn’t cover in the book. 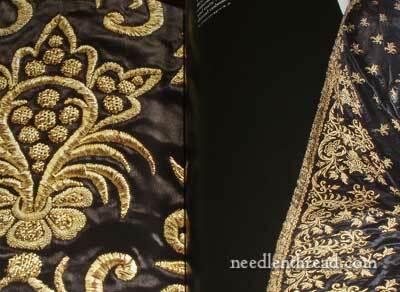 They were beautiful with all the embroidered handwork. Not every outfit had shoes but if the sign said shoes I was down on my knees looking at them. The rusty orange jacket thats on the cover I really wanted to take home but I think they would have noticed!! I think the thought that I had about the whole show was that the amount of hand hours that this show represents is mind boggling. The number of people who did all this work is just amazing. And this is just one show and this was the way people lived and dressed themselves. Just amazing! While the clothing is beautiful, I can’t help but think of the poor woman and children who spent long hours working in squalid conditions in order to produce them. 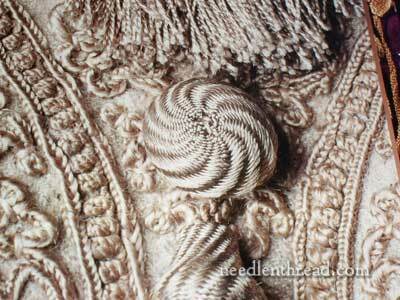 Can you imagine sitting for hours in a dimly lit room doing this kind of intricate work? Wow, Mary, thanks for the review. I just moved to Chicago from LA for school, and I was really disappointed that I couldn’t go to this exhibit when I went back for Christmas break. Luckily, I made a spur of the moment decision to go back home for spring break too, and this is right at the top of my list of things to do. So I will get to see the exhibit just a few days before it closes, and I think I may buy the catalog since the pictures are so beautiful. Oh wow, I think I have died and gone to heaven and I’ve only seen a few photos. I have sent an email to LACMA to see if they will post a copy of the book to me. Wish me luck. Thanks Mary, for showing this. If they still have copies of the book at the beginning of April, I’m buying myself one! Thanks for sharing a few of the pictures — while it’s all amazing, the needlework on the bottom of the pink dress is my favorite. Wow! 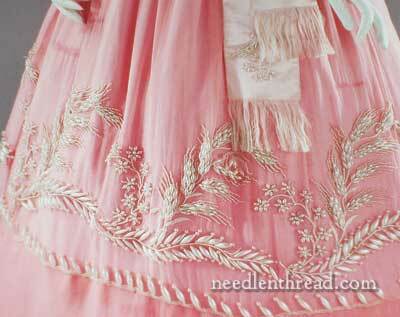 The detail on that pink skirt is just gorgeous, so fine and delicate! I agree with Hannah too though – the thought of the creator of those pieces and the often terrible conditions they had to endure while stitching really makes you think. How lucky we are to have electricity, comfortable chairs and tools that help us expedite the process…. Mary, thanks for the review on this one! 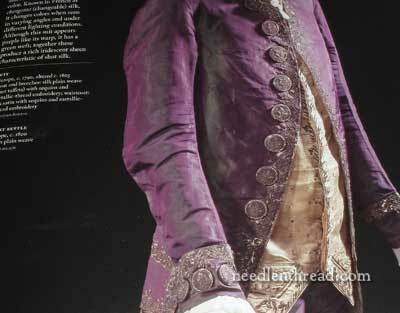 I ordered the book and am just stunned by the quality of the photography and the details on the garments.